Join Us!!! We are looking for someone to help us cover South American Club Championships basketball. Please send us an e-mail. 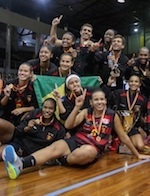 Recife of Brazil claimed the South American Club Championship title. They defeated Popayan for the trophy. Adriana Pinto (170-SG-78) scored 27 points to pace the champions. Popayan earned a 22:19 lead ten minutes into the game. The teams exchanged baskets throughout the second quarter. Popayan fired 25 points in the third quarter to open a 7-point advantage. But Recife bounced back with a 22:14 rally in the fourth stanza and snatched victory. Sandora Irvin (191-F-82, college: TCU) had 15 points and 14 boards, while Taina Paixao (176-G-91) added 14 points for the winners. Narlyn Mosquera and Yaneth Arias (184-F-82) responded with 17 points each for Popayan. The mvp of the Sudamericano was Adriana Pinto, the top scorer was Traore Astou (U.T.E., Ecuador) and Ferrari Paola (U.T.E.,Ecuador) scored more shots from 3 points line. During the tournament, there were also excellent performances of other players such as: Castillo (Arg), Valek (Col), Johnson (Per) Njonkou, (Bol), Morrison (Chi), Pena (Ecu),Gattei (Bra),Palacios (Chi) , Boquete (Arg), Comfort (Uru),Cejas (Chil), Ross (Col). In a great atmosphere for women's basketball in Quito (Ecuador) continues the international competition at the Sudamericano Femenino de Clubes that is approaching many enthusiasts not only in Ecuador but has become an event followed by many foreign nations for the high level shown on the court by the great players who are attending the event this year. The semi-finals were played to the access at the final games of each placement in the standings, all the matches were balanced and very spectacular. About the games, La Estancia de Popayan (Colombia) - U.T.E. (Ecuador) 98-88 (Kelly Santos 21, Ross Toccara 16 - Ferrari Paola 29, Traore Astou 26), Deportivo Berazategui (Argentina) - Sport Club do Recife (Brazil) 69-81 (Boquete Andrea 28, Castillo Sofia 22 - Irvin Sandora21, Moises Pinto Adriana 18), Universidad Austral (Chile) - Universidad Catolica (Bolivia) 86-78 (Mirchandani Lidia 23, Morrison Ziomara 21 - Njonkou Amina 26, Rodriguez Torrelio 20), Malvin (Uruguay) - Real Club de Lima (Peru) 84-73 (Hammon Jasmine 22, Somma Tarlovsky 16 - Lima Delfino 23, Da Silva Maria 12).